For most of us, well-intentioned but casual bike riders who secretly believe we might be Lance Armstrong's heir if we only had a few more hours a day to spend on our bicycles, buying a new road bike is tantamount to buying a road bike frame. The frame is what we're thinking of, something new and shiny and colorful, something we suspect even car drivers envy when they see us flash through the snarl of traffic. Truly, a road bike frame is a beautiful thing and part of the reason we love bicycling. When you have the good fortune to be looking at new bicycles, though, you definitely want to look at a few elements besides the color of a road bike frame. Face it. When you're on your way back home from a long Sunday ride and you're riding your thirty-fifth mile smack into a stiff headwind, the fact that your frame is cobalt blue or even Bianchi green is not going to help you. The length of your seat tube is going to help you and the length of your top tube and even the angle of the three main tubes all put together is going to help (or hinder) you, but color is not. 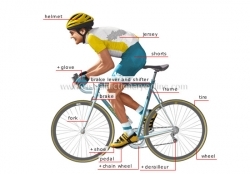 If you shop at a discount store or even a general purpose sports store, if you get any help at all in choosing a bike that fits you, it will probably consist of a clerk instructing you to stand over the top bar of the frame and see if you can comfortably straddle it with your feet on the floor. This is not really particularly helpful, especially if you happen to have anything unique about your physique, like long legs combined with a short torso. If you have long legs, you can straddle almost any bike, but will your body be able to relax comfortable in the stretch between your saddle and the handlebars? The whole geometry of the road bike frame matters a lot to fit. And fit matters excessively to comfort. If you're a racer, comfort will not be your only consideration. Indeed, it may be down among the last elements you consider. Speed is not usually built from comfort, and the road bike frame that promotes speed is built of different materials than one used primarily for recreational riding. Frames can be made of titanium, chrome-moly, aluminum or steel, and each metal has different advantages of weight and strength. Frame geometry varies, too, with touring bikes featuring a longer vertical base and top tube than the skittish racing models. So when you're looking at road bike frames, think beyond the paint. Get a frame that fits both you and your purpose. Whether you do your research online or in a good bike store, you'll be glad you took the time.